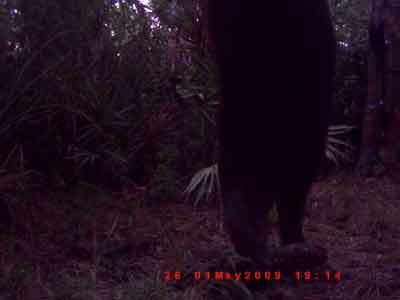 The game camera picked up a bear reaching up for the game feeder in May. Standing on its tippy toes at 7:14 P.M. it was trying to reach up and get a belly full of corn. The feeder is about 8 feet from the ground, which I always thought would be high enough for a South Florida Bear. Guess Not! I did not see this picture until I checked the game camera memory card at home after our June trip. 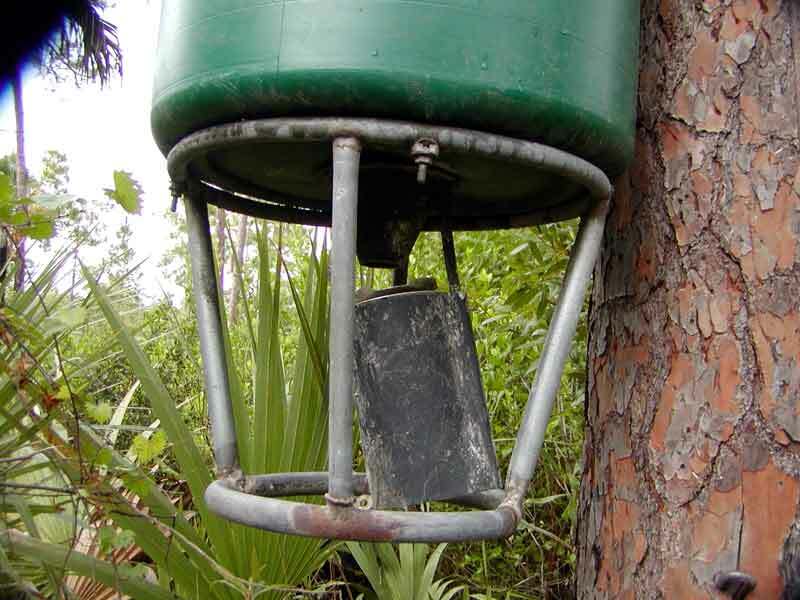 Upon Returning to camp in June, it soon became apparent that a bear had been visiting the feeder. The feeder was pulled down and the mechanism that throws the feed was pushed to the side allowing all the corn to fall out. The feeder was completely empty. It seemed that the bears damage visit was just a day or two before our arrival. In fact as we parked the buggy in camp and turned the motor off, we could hear a large animal running from the area of the feeder. Something that runs through palmettos, not something that goes around them. 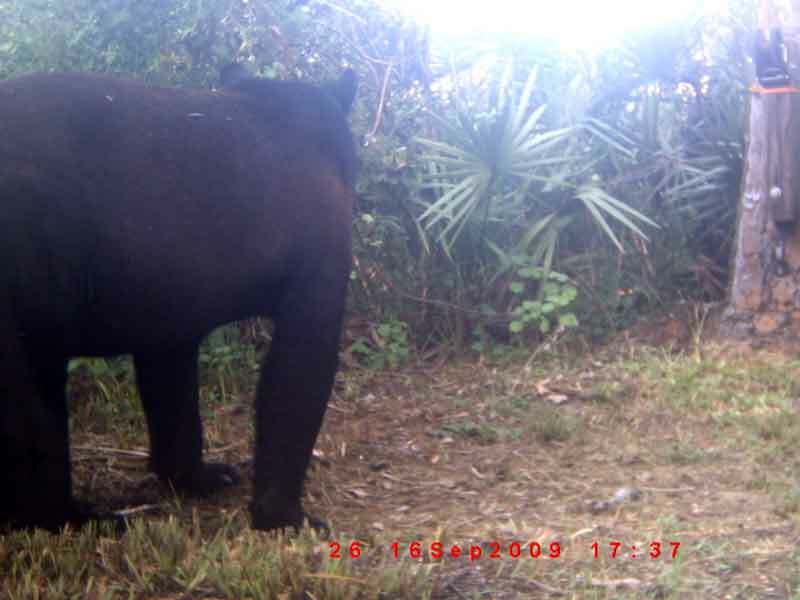 Later that day, a second walk down the trail to the game feeder revealed that the bear had returned while we were in camp. It left a pile of used corn right in the trail. 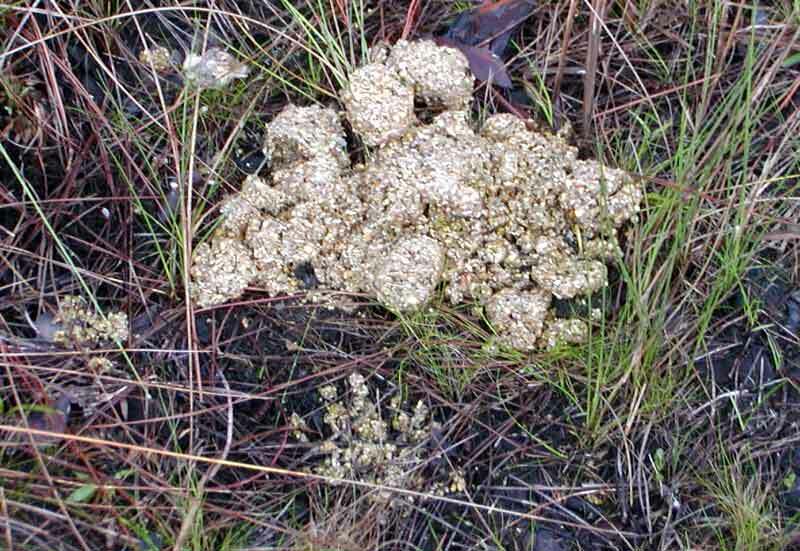 Yes, bears do sh*t in the woods and they don't digest corn very well. The feeder got to go home with us to be refurbished. No hanging around for it to be bashed about by a bear. The game camera this time was untouched by the bear and it shows that turkeys still return to the game feeder area while it is gone. Wild turkeys are creatures of habit. They will get into a routine that they follow every day unless something disrupts it. If a turkey gobbler walks through a camp yard about 10 A.M. in the morning, you can expect the next day that gobbler will walk through the camp yard about 10 A.M. 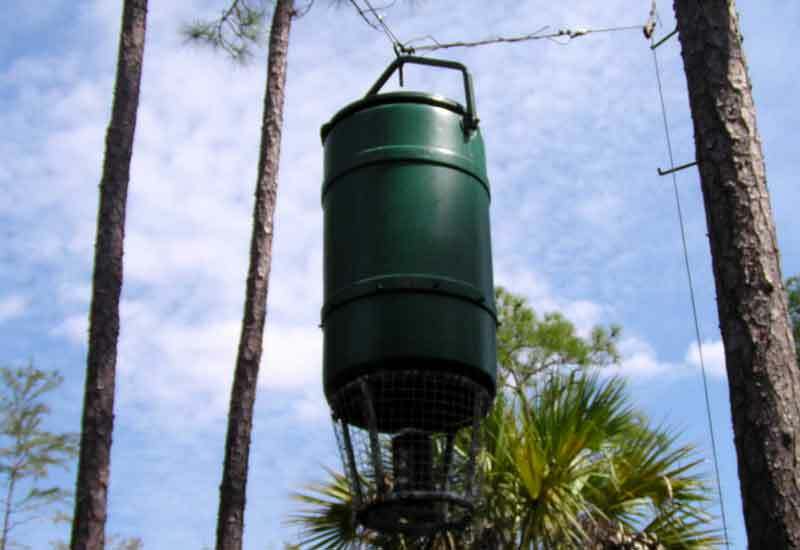 If turkeys visit the feeder about 9 A.M. in the morning, they will return about that time of the day on future days. This has been confirmed by the time stamp on the game camera. Once they start visiting, the pictures show it is about the same time every day. There will be a few days that they might not show up, but when they do it always seems to be the same time of day. On the September trip to camp the refurbished game feeder is back up in the air. Raised another foot off the ground it should now be higher then a swamp bear can reach. Time will tell. 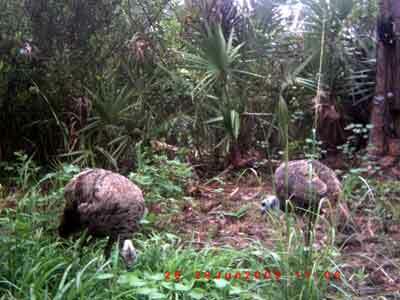 Here is a game cam picture taken in September, after the feeder has been installed higher. The bear is checking it out, but apparently can not reach the feeder anymore, because it was still up during our visit in November. 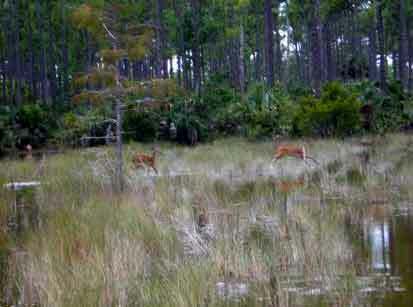 On the way out from camp in September, two deer decided to show us how fast they can run in water. 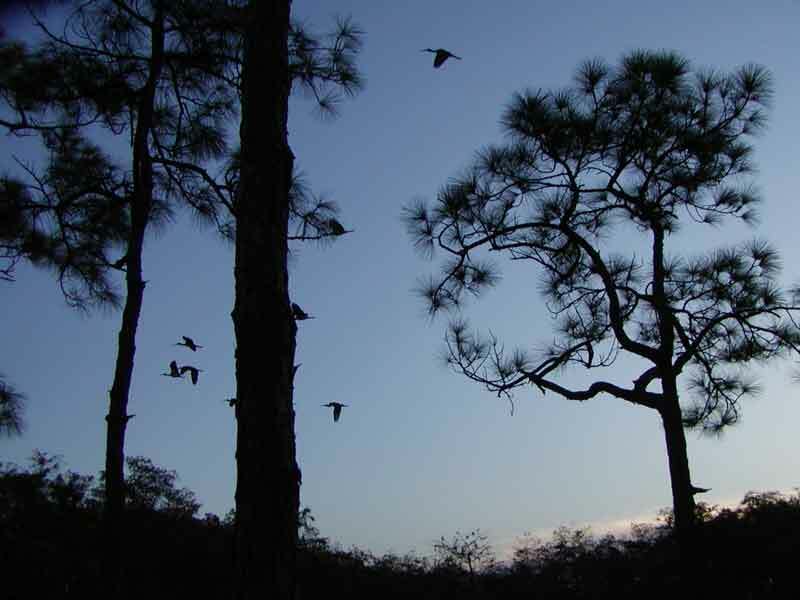 September is bow season and the wet time of the year in the Big Cypress Swamp. Well, like the Ibis in the picture to the left, today's time is done and time to head for the roost.